Nicole's home may be small, but it is full of style, and warmth. excited to share her home with you! I feel like my style changes a lot from year to year. As I’m getting older I am more drawn to minimalism even though I am a maximalist at heart. My current home is different than any of my previous homes because I am living with my boyfriend and we are combining our two styles. If I had to categorize my own personal style, it would be “modern bohemian”. Growing up, my parents flipped houses all over the Dallas area. I learned from an early age how to strip wallpaper, paint a room, reupholster furniture, update cabinet hardware, lay tile, etc.! When I was younger I hated doing all of this stuff, but now as an adult I am so glad that I learned all of these lessons as kid. I didn’t know it back then, but I was developing a passion for interior design at an early age. I currently work in philanthropy, but my true passions are for interior design and wellness. There’s no place I would rather be than at home cooking a meal surrounded by all the things that inspire me in my home. What inspired you when designing your home? A soul changing trip to Morocco back in 2010, my mother’s style, trips to the farmer’s market & the local plant nursery, thrift stores, bike rides, relaxation & comfort, and everything that Jen does! What do you love about your FMF pieces? I love that each piece is unique and has an unknown story. I love to think about the people who made these pieces and the families that enjoyed them before they made their way to my home. I love the sturdiness and durability of each piece. I truly feel that each piece will be a part of my home forever and that my future children will enjoy them too. I even love the small stain on one of my rugs! The beauty of these pieces is definitely in their details, imperfections, and history. Everywhere! I have so many design heroes that I follow on Instagram and blogs. But, my favorite way to get inspired is to travel. I try to pick up something new for my home from every city, state, and country I visit. Even though I love to travel I am also a big homebody at heart. 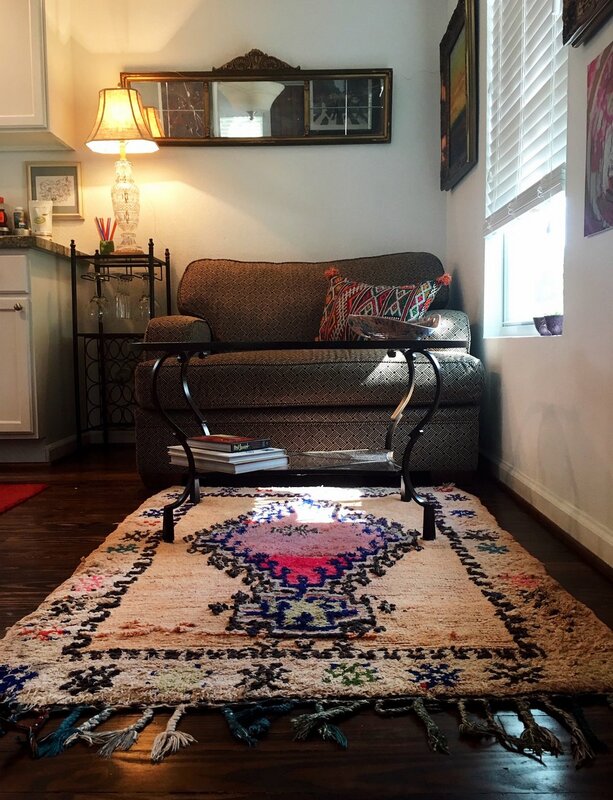 I love to be comfortable and relaxed in my home- big blankets, tons of pillows, shaggy rugs, and poufs are a must! What is a home design tip or trick you have learned recently? Simplify!! Our home is about 600 square feet so we had to be very selective about what we brought into our home. Only the items that we absolutely love passed the test. I love the intentionality of living in small spaces because everything has meaning and a purpose. I can look at every square inch in our home and find something that makes me smile. In the household, who loves your FMF poufs more, you or your dog? This is a tough question, but probably me! My dog loves the poufs and sits on one every morning while I do my makeup and get ready for the day. But, I am the one that would be heartbroken without them. Do you feel that you would be a secret member of the FMF sales anonymous group? I think the secret is out about how much I am obsessed with FMF! I have even inspired a few of my friends to buy some FMF pieces. What would be your dream FMF product? I am currently in the market for a new runner for our kitchen and also have my eye out for a double pouf to put at the end of our bed. But, if we lived in a slightly larger home I would be all over a large purple Beni! My mom for sure! She is a genius when it comes to interior design. I am always in awe of how she can transform a space so effortlessly. Every time I visit their home I always find something new. She has taught me that your home should be the best reflection of you and that it’s okay to change things up. As individuals we are always changing and evolving so don’t be afraid to change up your home as well. All photographs by Nicole Worley, used with permission.